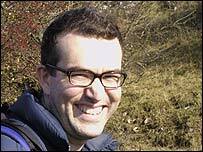 BBC News Online science and technology writer Ivan Noble was diagnosed with a malignant brain tumour in August 2002. Since then he has been sharing his experiences in an online diary. I am back in hospital, somewhat earlier than expected. The operation to try to remove my tumour and relieve the pressure inside my brain is still scheduled for Monday. But I got a nasty headache on Wednesday and the surgeon decided to take me in for observation. My plan, perhaps a little overambitious, had been to go to an old friend's birthday party in Berlin before flying back for the op. The reason for the headache was a pretty annoying blunder. Since this last bout of aggravation I have been taking a steroid called dexemethasone. It has some weird side effects but it is very good at controlling swelling and gives me a peaceful head. But, for most of the last two weeks, I have been taking entirely the wrong drug. My local pharmacist dispensed something with a very similar name. What he gave me did nothing for my head but would have been great had I had high blood pressure. I understand that these things happen more often than people think. After all that, I am very clearly in the calm before the storm. From my bed I can see the London Eye rotating and the planes coming in to land at Heathrow. A flock of birds has just flown past at the same level as my eighth-floor window. I have just washed down the first set of tablets, the right ones this time, with a cup of tea. Before I came in to hospital, I had a few busy days. I have consistently put off making a will and writing letters to my family. So this week I did those things and I feel better for it. I have great confidence in the operation I am about to have, but given that any operation carries a small risk, it seemed stupid to be totally unprepared. I wrote to each of my closest family and I made a film for my daughter. It is a very difficult and painful business to try to compress everything you would like to say to your growing daughter in the future into less than ten minutes of film. I hope that she never sees it. I will write again after the operation. Send your comments to Ivan. Hi Ivan, I have been following your diary from Singapore for quite a while now. Just to wish you well and hope you're not feeling too lousy post op. Never underestimate the strength and impact of your words even from the other side of the world. Your very positive attitude is a great source of strength and inspiration to us all. No doubt you've had thousands of messages of support. I just wanted to add mine. As the father of an 18 month old little girl, I can only imagine the stress, pain and anxiety you are going through. I hope the op is successful and enables you to get back to your family as quickly as possible. All my very best. This is the first time I've read your diary Ivan, but I just wanted to say thank you for sharing your experiences. Not wanting to sound soppy or patronising, but you are inspirational. Good luck for Monday, I hope the op. is a great success and keep up the diary. I suffered a tiny tumour two years ago and had the op and radiotherapy and all that stuff. It was discovered 2 days prior to our family leaving for Australia on a house exchange. Needless to say we did not go. However I was given the all clear after the op and left one month later. Last year we moved to Canada. I guess some would say that I and my young family are crazy, we should have stayed put. But life is for living and it made me realise that I should do the things that I care about. I hope all goes well and whatever happens do the things that you can with your family. Good luck Ivan and don't worry. My wife is a neurosurgery theatre sister in Southampton and she assists in these operations all the time as part of her job. There are many, many success stories and there is no reason why you shouldn't be one. I hope your operation runs smoothly on Monday. My thoughts are with you and your family. Good luck Ivan, your courage is amazing. As a father myself I can understand just how hard it must have been making the film for your daughter. Stay strong and all the best. I think you are amazing and I wish you a successful operation. There must have been many occasions on which the keeping of this diary was the furthest thing from your mind and it is to your credit that you have persisted with it. I think many would agree with me that, while I feel privileged to be reading it, I hope the need for it abates again soon. Ah the greatness of medication! I too am a member of the great 'cancer club' but am ten years down the line but not out of the woods. I will be thinking of you on Monday and will follow your progress. Very best wishes for the operation. I hope it goes well. I look forward to reading some positive news in your next diary update. Good luck! Good luck with the operation on Monday. I wish you all the best and have been following your tumour diary since you started writing it. The great escape Rollercoaster Teeth and tears Encouragement Asking why?